Join us, donate, contribute, get involved! “The match is yet to begin and Liverpool has already conceded a goal. It is an own goal by Liverpool FC to deal with a Chinese commercial company that exploits Tibet’s resources. Liverpool Football Club must understand the sufferings and sentiments of Tibetan people. Partnering with Tibet Water Resources Limited is like endorsing the occupation of Tibet and agreeing with treatment of Tibetans by Chinese regime”, said Pempa Lobsang, the chairman of the Tibetan Community in Britain. TCB’s Spokesperson Tenzin Tashi la explains “Liverpool FC should know that China occupied Tibet by force and Tibetans are facing worst human rights abuses in the world. I urge Liverpool FC’s Commercial Department not to trade human rights for commercial gain. I don’t want Liverpool FC to be a partner in crime in abusing human rights of Tibetans”. Tibetan Community in Britain demands the termination of this unholy and unethical partnership in torturing Tibetans further and save long standing reputation image of the club. 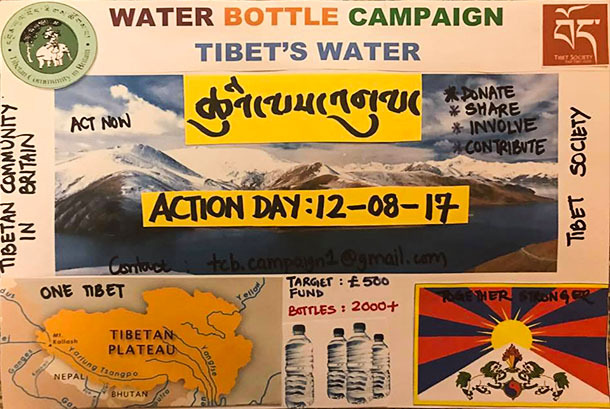 Chairman of Tibetan Community UK has launched Tibet Water Awareness Campaign. This entry was posted in #environment, @LiverpoolFC, Keep Tibet Alive, Tibet Water Awareness, TibetWater and tagged #anfield, #arsenal, #championsleague, #coutinho, #DASERSTEMAL, #environment, #Football, #Hoffenheim, #KeepTibetAlive, #klopp, #LFC, #LFCTSG, #Liverpool, #LiverpoolFootballClub, #liverpoolnews, #TibetSociety, #TibetsRiversAsiasLifeline, #TibetWater Awareness #LFC @LFC, #TibetWaterAwareness, #TibetWaterAwareness#TibetWater, #uefachampionsleague, #waterbottlecampaign, @achtzehn99, @achtzehn99_en, @LiverpoolFC, ‏#TSG, Campaign, CHAMPIONS LEAGUE, deal, emirates, http://bit.ly/2vlbncG, Pempa Lobsang, Please sign the petition, premierleague, Sign petition, soccer, Tibet Water Awareness, Tibet will never walk alone!, Tibetan Community UK, TibetWater, UCL, uefa. Bookmark the permalink.